Checklist is a tool that is widely used to facilitate completion of sophisticated tasks that involve many activities and actors. Software development teams benefit hugely from such things as release checklists (make sure that tests pass, release notes are ready, the build is uploaded somewhere, etc) and feature integration checklists (similarly, old tests pass, new integration tests are automated, documentation for the new functionality is written, the thing is accepted by QA, etc). The tools of this kind serve greatly to coordinate the actions performed by different persons or teams. At the same time, I believe that checklists also bear great power as an individual efficiency tool and that's where I didn't see them used much. I first employeed a checklist for my own use when I tried to add some structure to my weekly task of analyzing team's performance and planning the next sprint. Even though I had a certain routine and even a quite stable form of the final result of this activity (a report and a list of Jira items for the next week), sometimes I forgot to check certain aspect of our performance and highlight it in the report or overlooked some items that needed action during the next week. Thus my key intent was to provide myself a list of things that I must do to consider both the report and the plan done. Additionally, I wanted to review the process of preparing the plans to exclude any obsolete steps. The results were great: once I put the new checklist into action it started saving me about an hour each week (half of it from mere thinking of "what else I forgot to include in the plan"). Additionally, after I defined this routine explicitly it became easier to think about it and spot other items, which don't bring much value or get ignored consistently - and to exclude or rework them, saving myself even more time and nerves. There are several similar checklists in my toolbelt that facilitate other tasks and work great, but there is also a bit different thing that I consider my greatest finding - that's my daily checklist. The initial idea was to have a short list of things that I wanted to do daily and to go through it every evening before leaving the office. I quickly got used to the routine of tagging portions of job on the list as done at the end of the day and at some stage expanded it to ensure that I don't forget some other things - the benefits turned out to be tremendous. First of all, making these routine checks helped me acquire the habits I wanted and somewhat refocus my work on the things I consider important. Additionally, since putting this checklist into action I had much less cases of forgetting to do certain things, because I get reminded of them before I go home. One change that I didn't expect is that this routine made me generally less nervous about the job: I don't have to rush into reviewing every new pull-request or responding an email from partner, because I know I will notice these things later: looking into both pull requests and mail inboxes is on the list, like other similar things. Thus the checklist makes me more efficient through decreasing the stress of urgency, serving as a reliable reminder and paving a short path to making myself more disciplined. In the end all this boils down to freeing my mind for more important tasks than just being afraid to skip something important. 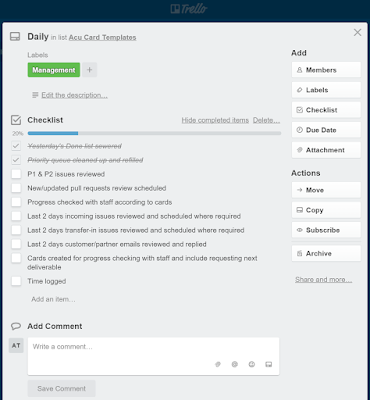 Another powerful thing about this list of daily tasks is that it forces me to check some aspects of the team's current situation at the end of the day, which sometimes produces unexpected results. For example, I had several cases when this review allowed to spot urgent tasks and made me adjust plans. Furthermore, sometimes the nightly check made me notice a vague relation between a problem that we were dealing with during the day and a different problem that sit in our backlog waiting for us to find a way to address it. At least once such a discovery allowed our team to track down and fix a data corruption issue that bothered our partners a lot - and it could have evaded us again if I didn't perform the routine review of our status that evening. It's true that using checklists routinely - especially daily - may require some discipline and motivation. Thanks to the amazing 'To the Moon' talk by Russ Olsen, when going through my daily checklist I always feel acting like Neil Armstrong and Buzz Aldrin did before transmitting "Houston, Tranquility Base here, the Eagle has landed". It might seem childish, but it's fun to feel like you've just landed a moonship when you're simply leaving your office at the end of a long day - and that's a part of my motivation.